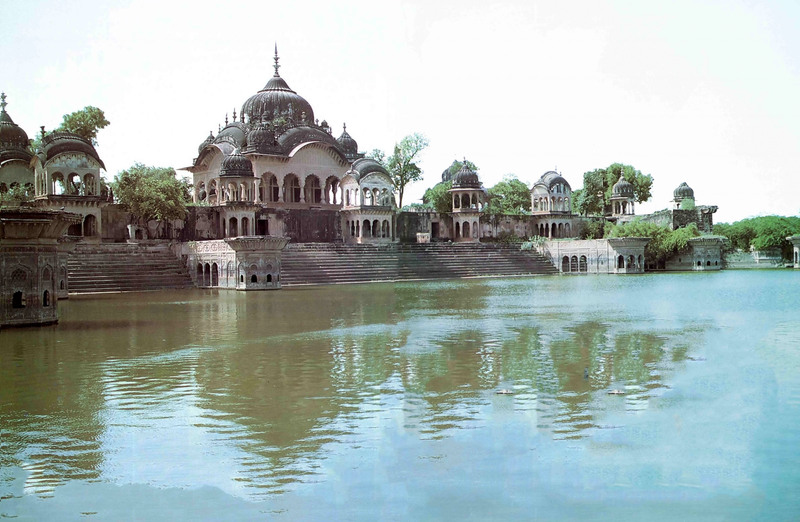 I once visited Vrindavan, India with His Divine Grace Srila Prabhupada. As I accompanied him on his daily walk one morning we suddenly came upon a particularly beautiful spot. The cool sands were thick with foliage; the tall trees full of singing birds. As the sun brightened the clear morning sky, peacocks filled the air with their peculiar call. “It’s wonderful, Srila Prabhupada,” was all I could reply. I felt that he was actually revealing the glories of Vrindavan to me even though I had no particular spiritual qualification. Vrindavan is the place where the Supreme Lord Sri Krishna appeared five thousand years ago. Lord Krishna descended there from His own spiritual planet, Goloka Vrindavan to attract us by displaying His supernatural pastimes. Srila Prabhupada has explained that when Krishna descends to the material world, this same Vrindavan descends with Him just as an entourage accompanies an important personage. Because when Krishna comes His land also comes, Vrindavan is not considered to exist in the material world. 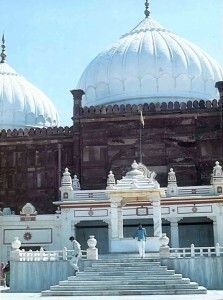 Therefore devotees take shelter of the Vrindavan in India, for it is considered to be a replica of the original Goloka Vrindavan. 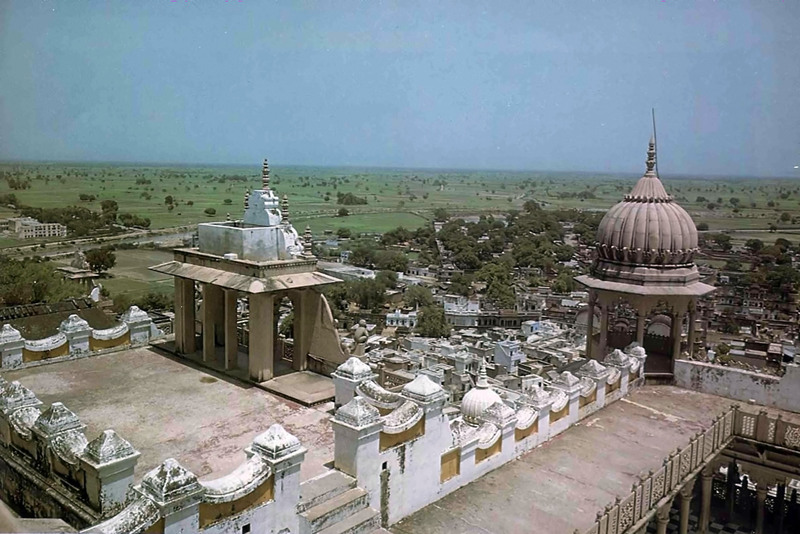 New temple (foreground) rises at site of Lord Krishna’s birth. Old temple was destroyed by Mogul emperor Aurengzeb, who built a mosque in its place. Pilgrims can go down into the cellar and see a replica of the prison cell where Lord Krishna first appeared. Even today one can see many different kinds of wildlife in Vrindavan. Indeed, the are appears to be a kind of sanctuary where all living entities can take shelter. For example, Vrindavan is a haven for cows. Hundreds of them in herds go out into the pastures in the morning and dutifully return at sundown. Some venture through the town streets and are fed, patted and offered respect and worship, for everyone knows they are Krishna’s favorite pets. 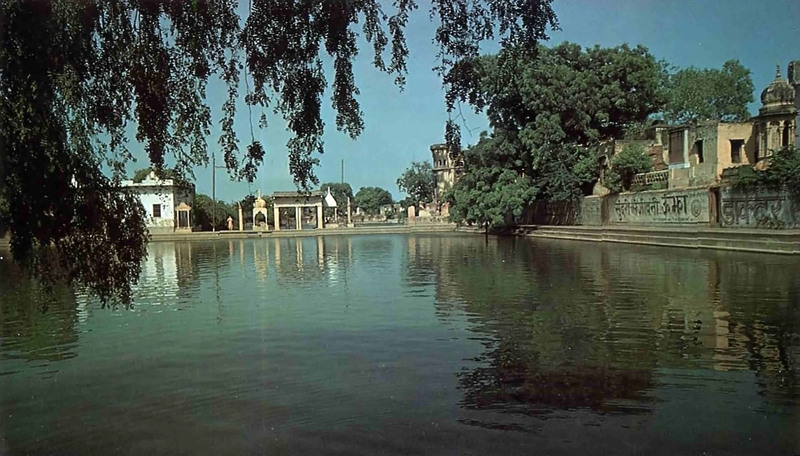 Once, on my first visit to Vrindavan, I bathed in the Yamuna and then began walking through one of the outlying forests. I was marveling at how the forest floor had been transformed into a neatly clipped grass carpet by the feeding cows, when suddenly a stream of them came through the trees. Soon hundreds of white cows were all around me, sometimes eating the grass, sometimes nibbling at the leaves on the low-hanging tree branches, sometimes frolicking and running like playful friends. As the passing herd started to thin out, I saw a cowherd boy in the rear, chiding some of the stragglers. He was about nine years old, dark and frail, clad in a simple cloth and carrying a small stick. He ran behind the white heads of the cows, fully absorbed in his occupation. Upon seeing such a sight as this in Vrindavan, how could one possibly not remember Krishna, who is renowned for His role as a transcendental cowherd boy? White mogra flowers and red rose petals, soon to decorate a temple Deity, are patiently strung into a garland by a resident of Vrndavana. 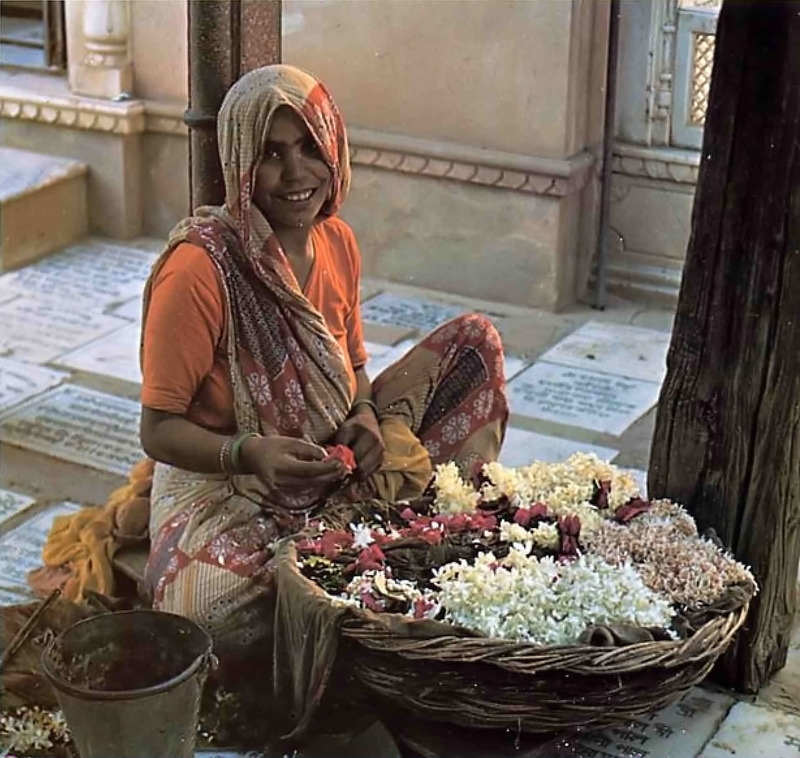 Devotees say that by wearing garlands, Lord Krishna makes the flowers more beautiful. Many elderly Bengali widows have also made Vrindavan their haven. Their backs bent with old age, they crowd the city’s streets while intently going to the temples. They are especially seen in the early morning on the banks of the river Yamuna, where, draped in their white widows’ saris, they look like a flock of white ducks, dipping and bathing and offering their oblations. 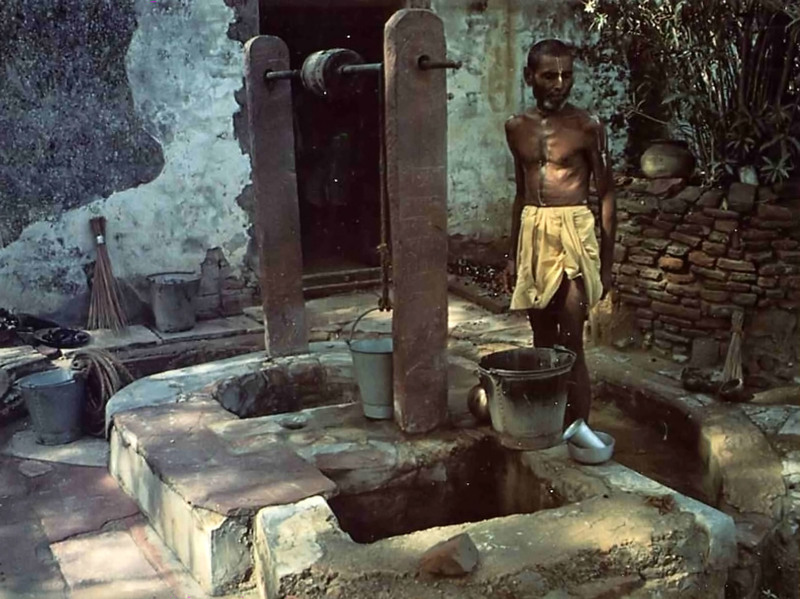 It is said that half of Vrindavan’s twenty-five thousand residents are these Bengali widows. They have come to Vrindavan to die. Having brought whatever life savings they had and deposited it with one of the temples, they receive a room and bare necessities, and in this way they count their days and their prayer beads until they pass away. 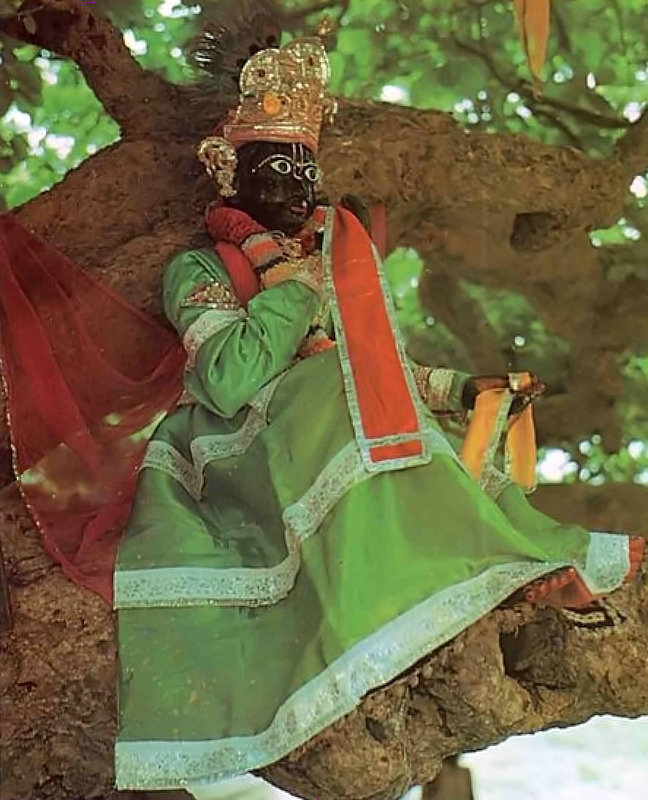 Although to die in Vrindavan is certainly auspicious, Krishna recommends in the Bhagavad-gita that wherever one may die, if he can at that time remember Krishna or His activities, name, form, or abode, then he is immediately transferred to the transcendental planet of Krishna. Deity in a tree. Krishna is worshiped as the boy who stole the cowherd girls’ clothes while they bathed in the Yamuna River and teased them when they begged for His mercy. Other inhabitants of Vrindavan are the artisans, the silver craftsmen, the doll makers, the bead carvers, the carpenters, and the shopkeepers. They are all Vrajavasis (people born in Vrindavan) who can trace their families far, far back, and who themselves will never care to leave Vrindavan. There are also the caste gosvamis, who by birthright are the mentors of the temples. They are the town’s brahminical aristocrats and are given all respect. Finally, there are the pujaris or temple priests and the numerous babajis. The latter are simply humble beggars, frail and nearly naked, who wear broad clay marks called tilaka on their dark bodies. They eat at the free kitchens called chatras and have no fixed address. Exquisite Sriji temple, honoring the birthplace of Srimatl Radharani, overlooks village of Varsana and the lush countryside where Lord Krishna displayed His transcendental pastimes five thousand years ago. 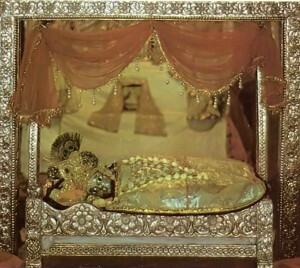 Taking rest in the Mirror Temple, little Deity of Krishna lies on soft bedding. Vrindavan residents say He’s only pretending, and will soon get up to steal some butter – one of His favorite pastimes. 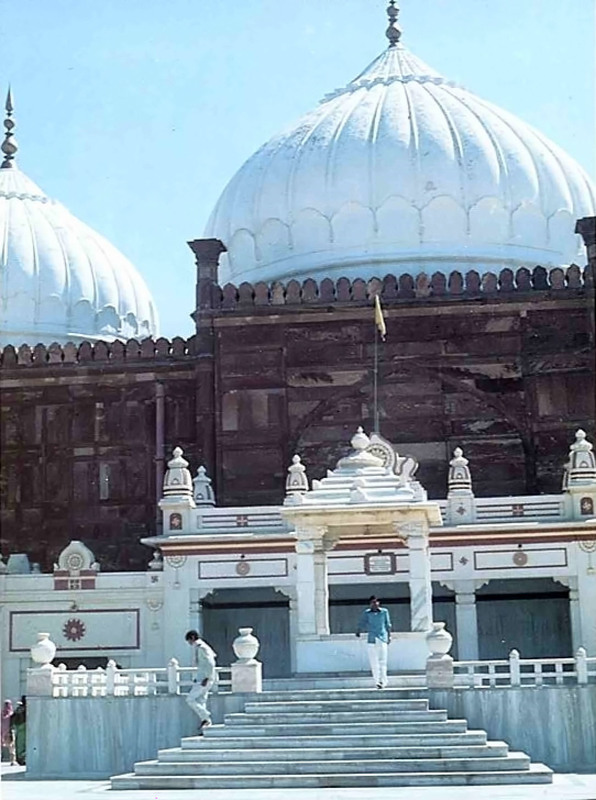 The Srimad-Bhagavatam recommends that when one visits a holy place like Vrindavan, he should take spiritual instructions from the holy persons residing there. Unfortunately, most visitors to Vrindavan fail to do this, and they leave Vrindavan having done little more than take a bath there. Even so, anyone who goes to Vrindavan will be benefited. His Divine Grace Srila Prabhupada explains in his Srimad-Bhagavatam: “Any person may go [to Vrindavan], and even if he is sinful, he will at once contact an atmosphere of spiritual life and will automatically chant the names of Radha and Krishna. 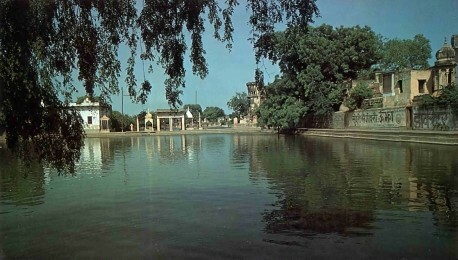 This we have actually seen and experienced.” In the Nectar of Devotion, Srila Prabhupada further comments: “The places in the eighty-four square-mile district of Mathura, [in which Vrindavan is located] are so beautifully situated on the banks of the river Yamuna that anyone who goes there will never want to return to this material world.” Srila Rupa Gosvami has confirmed in his Bhakti-rasamrta-sindhu that even non-devotees who come to Vrindavan can experience transcendental emotions. 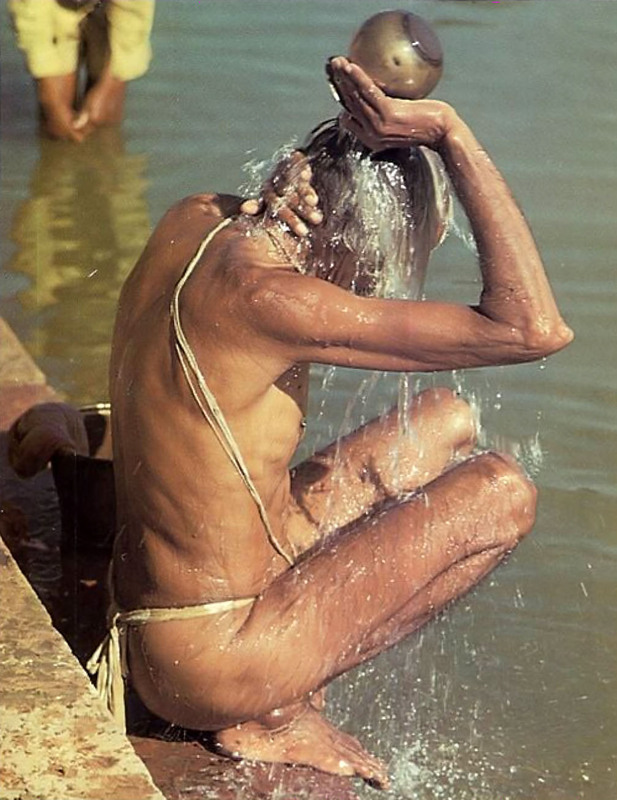 Devotee douses himself with purifying Yamuna water from his brass lota in a Vrindavan-style morning shower. Multistranded thread over his shoulder signifies brahminical status. The best way to experience Vrindavan is to humbly approach a pure devotee of Krishna and try to receive his mercy. Because he has seen the Absolute Truth, the Supreme Personality of Godhead, he can open our eyes and anoint them with love so that we can also get a glimpse. In the same way that a pair of eyeglasses enables a person with poor vision to see everything clearly, the pure devotee is the transparent via medium through which we can clearly perceive God. Therefore to fully appreciate Vrindavan, one should become a devotee of Krishna and become Krishna conscious. Sweet water well on grounds of Madana-mohana temple refreshes thirsty visitors. In a little shelter just a few yards from here, the great devotee Sanatana Gosvaml wrote his many books during the Sixteenth Century. 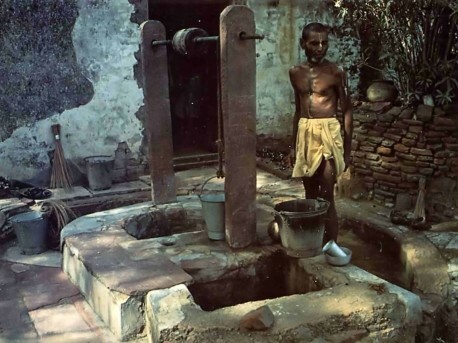 Once, Lord Krishna, disguised as an ordinary cowherd boy, agreed to serve Sanatana, His pure devotee, by drawing him water from this well. Present-day attendant enthusiastically offers the tasty water to all who come. Anyone who goes to Vrindavan should carefully avoid committing any offense there. Vrindavan is the sacred abode of the Lord, and to act sinfully there is equivalent to offending Lord Krishna Himself. A sin committed in the Lord’s abode is called dhama-aparadha, and is severely punishable—one hundred times more so than if committed outside Vrindavan. Conversely, a pious act performed in Vrindavan yields one hundred times greater benefit than one performed outside. The numerous hogs, dogs, monkeys and turtles who inhabit Vrindavan attest to many impure devotees who in their last life committed sins in Vrindavan. They’ve taken birth in one of these lower species, but in their next life, due to developing an attachment for the sacred dust of Vrindavan, they will be promoted back to Godhead by the Lord’s mercy. One should not make the mistake of prematurely retiring in Vrindavan. 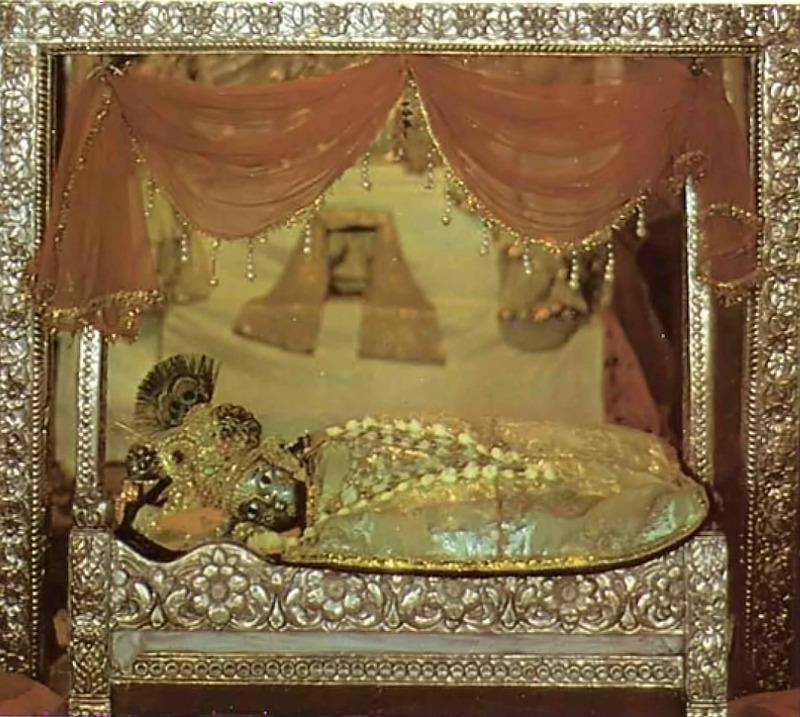 If one is not advanced in Krishna consciousness and goes there to retire from material activities, he is quite likely to perform material activities in Vrindavan. To prevent this, the Vedic system of varnasrama-dharma provides for a gradual disentanglement from material life. Before taking sannyasa, or complete renouncement, one may enter the order of vanaprastha, in which all family and business responsibilities are handed over to the elder sons. Thus one can travel to various places of pilgrimage with his wife, always, however, maintaining strict celibacy. But one who is pure enough to actually reside in Vrindavan can develop love of Godhead by following in the footsteps of one of the eternal residents of that land. He should try to emulate the deep devotion of Krishna’s friends, parents, or conjugal lovers. Consider Krishna’s uncle Akrura: when he entered the outskirts of Vrindavan and saw Krishna’s footprints in the dust, his ecstatic love for Him increased so much that the hairs on his body stood up. His eyes were flooded with tears, and in ecstasy he jumped from his chariot and fell down on the ground, calling out, “How wonderful this is! How wonderful this is!” Such pure devotion is the ideal way of seeing Vrindavan. When one loves Krishna this intensely, he also loves Vrindavan in the same way, for one cannot separate Vrindavan from Krishna. 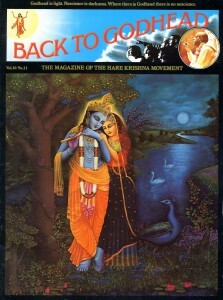 Indeed, Krishna is eternally present there, inviting us back to His wonderful abode. 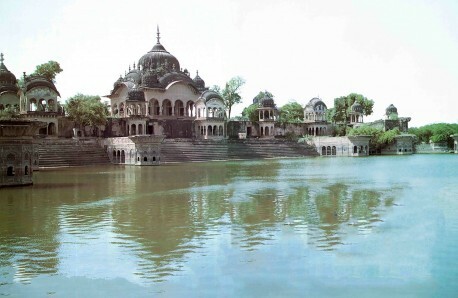 Temples surround lake at Radha-kunda, sacred bathing place of Srimati Radharani. A small sum rents a tiny one-room house here for a lifetime. For centuries saints have made this their home. The great poet and devotee Krishnadasa Kaviraja Gosvami lived here in a simple hut as he wrote the magnificent Sri Caitanya-caritamrta, a glorification of Lord Caitanya’s pastimes. Want to visit vrindavana in comming days…gonna meet devotes and gurus…want to spend some days in heavenly vrindavana.. Jay shree krishna!!!! Jay radhe jay krishna jay vrndavan. Haribol!